Live the Hawaiian Lifestyle in this elegant townhouse in the gated Fairways at Mauna Lani within the world class Mauna Lani Resort. With over 1,289 square feet of luxury living space; this unit comprises of two bedrooms, two full bathrooms, and comfortably accommodates up to six guests. This townhouse backs onto the Francis H. Brown North Golf Course creating indoor/outdoor living space with exceptional privacy, swaying palms, and breathtaking sunsets. Guests have access to the Private Mauna Lani Beach Club with white sand beach, snorkeling, restaurant, board rentals, cabanas and beach chairs. Everything you need for luxury resort living. This stunning villa is newly renovated in soothing ‘Blue Hawaii’ beach décor, and features soaring twenty-foot vaulted ceilings and huge picture windows providing beautiful natural light. The fully-equipped kitchen features granite counters, stainless-steel appliances, great new cookware including a NutriBullet for iced smoothies, and a coffee grinder and coffee press to indulge in the islands famous Kona Coffee. The dining area has seating for eight and opens onto the large, very private Lanai with lush tropical landscaping, and relaxed, plush casual seating area with foot rests. There is also a shaded dining area and a granite counter with a wet bar and a gas grill. Enjoy the privacy and golf course views while preparing a meal or just relaxing with friends and family. The beautiful bedroom suites are located on separate levels to assure privacy. The master suite features a cozy king-size bed and a private balcony. There is a spacious bathroom with a walk-in shower and a deep-soaking jet tub. The second bedroom offers two twin beds that can be converted to a split king upon request and for an additional fee. We provide upgraded linens and luxurious pillows for the sleeping comfort of our guests. Enjoy our complimentary upgraded high speed internet, a brand new smart TV, in-suite washer and dryer, air conditioning, extra beach towels, boogie boards, Tommy Bahamas beach chairs and beach umbrella. The Fairways at Mauna Lani, centrally located on the Kohala Coast, enjoys the most consistent and perfect weather in all the Hawaiian Islands (320-plus days of sunshine). Renowned for its history and beauty, your days can be spent relaxing on the beaches, walking the shorelines, viewing the historic fish ponds, discovering green sea turtles, snorkeling in the calm bays with an abundance of tropical fish, or simply relaxing on your quiet shaded lanai. This villa, while very private is less than a two-minute walk to the large free form pool with a hot tub, waterfalls, large gathering area with BBQ’s, and access to the on-sight gym. The Fairways at Mauna Lani is a 30-minute drive north of the airport. 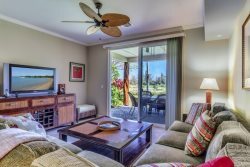 The Villa is located within walking distance to Shops at Mauna Lani where you will find a grocery store, quaint shops, excellent restaurants like Tommy Bahamas Restaurant and Ruths' Chris Steakhouse. A ten-minute drive takes you to the Kings’ and Queens’ shops.